Ahh the smell of fresh coffee wafting from…your medicine cabinet? Have you noticed most medicine comes in little plastic capsules? These capsules protect your drugs, but they aren’t as safe as you might hope. That’s because plastic is usually made with toxic heavy metals. But don’t spit out that pill just yet! Before adding the medicine, the toxic metals are removed. Why use toxic metals in the first place? Because that’s been the best way to make these materials. …until now! The Traverso and Langer labs at Harvard and MIT have found an interesting solution. As with most of us, they were inspired by their morning latte. They’ve found that caffeine can be used to make plastics! 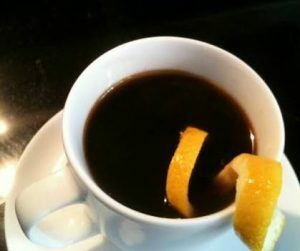 Their recipe calls for caffeine and a pinch of citric acid, the ingredient that gives lemon its bitterness. These new safe materials can be loaded up with a variety of common medicines. This new technology can usher us into an age of cleaner plastics! So how would you like your pills — with a little cream and sugar? And maybe a donut?